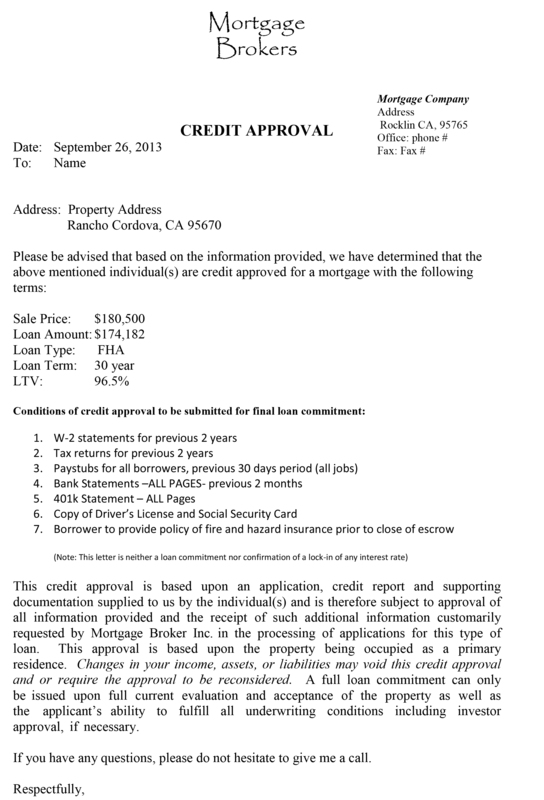 The pre-approval letter is different than the pre- qualification letter because the lender or their agent examines some of the documents and checks the credit report. Don’t let the mortgage personnel short circuit the process and just write the letter without checking. The danger is that there may be issues in the credit report or with the documentation on the loan process that needs to be fixed. Time is the friend of a credit issue when found early. Time is the enemy when found late in the process. The pre-approval letter is the best time to find out if there are any problems. If the lender or their agent cannot write the letter for the property or the amount, find out early. Working on lending problems with credit history or documentation issues does not mean the first time home buyer can’t get their home; it just means there is work to be done. The key to finding financing problems is not taking them personally and work with the mortgage professional to resolve them. One of the big issues that come up in the pre-approval letter is the amount of the loan lenders are willing to make. Sometimes it is for 10’s of thousands of dollars less than the borrower would like and think they could handle. These may mean looking in new areas or for a much different house. The current reality of the lending environment many times dictates what home could be financed. Finding out early in the search will save time and money. It could mean in a hot real estate market missing out on a good house because of searching in the wrong price range. Ignorance is not bliss. Reality may be different than desired. The number one time saver is searching for the correct price range house early in the process. Getting the pre-approval letter is one of the best tools to achieve this goal.